This thread serves as a continuation of the "Sister Wives of the MCRmy" thread and is also a new introduction to the thread for those who may have been scared off form the size or content of the previous thread. I want to cover some quick ground rules for this thread and secondly review the original goals of the thread. -Everyone must interact with each other with respect and thoughtful consideration. -We have to believe everyone has good intentions and not assume we are being ignored when our posts are not answered immediately, since many conversations are often happening within a short time frame. -Considering our background and rules and regs, issues related to self harm and suicide MUST be addressed outside the boards or via pm and cannot be mentioned within this thread. This site and thread must be a safe place for all people and not discussing these issues on the boards is one measure we must take towards helping and protecting friends. -Posts regarding the band's personal lives will be removed. This includes anything to do with their wives/children/families (pictures, jokes, discussion), fan-fiction (pictures, poems, stories) and... well, personal stuff! Please refrain from posting comments of this nature. -People can and should share with the group if they are having a hard time, but we must try to discuss these things in a way which is not negative, offensive, or brusque. While negativity may not directly be against the rules and regs, it is just as destructive to many people who frequent this thread and sometimes makes it difficult to participate or know what to say. -While we should try to help our friends, this group can only do what it can do within our limited means and it should be recognized that this group is not therapeutic in nature. Often sister wives are dealing with personal issues on their own, but still continue to try to do what they can because they care about their friends. Sorry for the seriousness of the rules and the amount, but this new start merits discussing some of these issues which came up in our discussion from last week. I did not know if everyone saw that and wanted to make sure we all had seen it. Participation in this thread means that we agree to abide by these rules and the rules and regs of the boards, which mirror these rules as well. I have not yet been contacted by Kerry or another mod; So there may be new rules which they want me to include later. I will direct you all towards those rules when they tell me what they would like included. If anyone has questions of concerns about these rules, let's have a discussion and reach an agreement as a group. So on that note, here's a llama and enjoy the reboot! Let's make the most of this opportunity to treat each other in kindness, good faith, and respect. I love each and every one of you and hope we can live up to the lofty ideals of the original thread. Our sisterhood is formed on the bond of MCR and a love of one wonderful man, Kevin I, aka the energetic kid in LOTMS. A). The Sisterhood was formed as a lighthearted approach to further our bond as MCR fans. We are in no way worshiping or stalking the enthusiastic MCR fan presented in Life on the Murder Scene, whom we have named Kevin I in an approach to neutralize certain indelicate terms used in his reference, and promise not to frighten him if he is ever found. And if he is discovered to no longer be a fan, we promise not to damage him. B ). In choosing the term "Sisterhood", we are in no way excluding our male friends. We are simply making a play off of the television show and would love to invite our male friends to be Sisters. C). None of this is to be taken seriously, except for our newfound camaraderie. This is all lighthearted and tongue-in-cheek. This boy's a genius. I want to marry him. Can we all marry him? All at the same time? -dies- You just made my night... "Sister Wives of the MCRmy" has a nice jingle to it. Would we all be married to Kevin I? That would be pretty sweet We could all have complementary MCR themed tattoos as well to seal the bond. We'd have tons of cute redheaded kids running around, rocking out to Hang Em High. We'd braid each others' hair and go see MCR as a big family outing. If our show got big enough, I'm sure one day the boys would casually swing by our house to hangout and chat about our LOTMS devotion. Anyone else have thoughts to contribute about our random lives as the sister wives of the MCRmy? I cant wait for this to start up again. This is the most perfect think I have ever seen. I found out theres a llama farm near my neighboorhood. I think theres one somewhere around me, but I havnt found it yet. since the sister wives thread is the doctor. FOUR YOU GENIUS. OH MY GOSHERS. THIS THREAD IS THE DOCTOR. hmmm that's an interesting one, what does everyone else think? I know I hope to join in more too! i've met so many nice people in the Rmy and I love talking to you guys! I hope we get more sister wives to join in! You guys maxed it out huh? Wow that's awesome! My first horse came from a llama farm. So that means there is one around here somewhere. 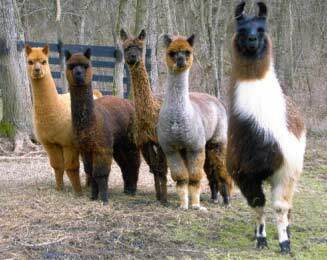 But there are a few Alpaca farms, there is one like a mile away. Their website says to come take a tour. So I think I will in the spring. We did max it out Bri, did you like your secret santa Christmas present?